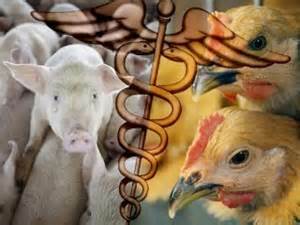 Bird Flu And Swine Flu - Is The Animal Kingdom Striking Back? Is There Time To Mend Our Ways? In the years 1995/1996, I was living close to a famous beauty spot, somewhere along the coastline of one of the oceans of our world. It is a place that poets and bards used to write and sing songs about, which to this day are being performed and enjoyed by people. What also existed in that place these days, was something of quite a different nature, to which I would like to draw your attention. As it unfortunately is all too common an issue throughout our world, there is no need to mention the real name of the place. It is not my intention to point a finger at any particular country or place, but to talk about the plight of the animal kingdom. Through the outbreak of the bird flu, this has become an even more urgent issue than it was ten years ago. I would like to share my story with you, because I feel intuitively that it can shed some light into the spiritual background, the purpose and meaning, of the threat of a possible epidemic we and our world are at present facing. This article has been updated in the light of what could be coming towards us, in the hope that it may speak so much to your heart and soul that you, as healers, feel motivated to wish to do your share and take some kind of constructive action. By the way, I am aware that many of the issues in this article have already been discussed in ‘The Random Jottings of a Stargazer’ Part 1/1. As I would like this article to stand on its own, so that it can talk for itself, I have not removed these parts. And yes, there is a great deal we can do. But, before you find out what that is, first hear my tale. One bright and sunny day at high tide, a friend and I decided to visit the above mentioned beauty spot, let us call it Bird Island. As up to then, it had been our favourite place in a world famous bay, we were eagerly looking forward to an enjoyable outing, as it always had been on previous occasions. When we set off, the sky was a clear blue, and a stiff breeze was sending fluffy white clouds scudding across it. The sea promised to be spectacular – what a day this was going to be! However, as we approached the beach, a nauseating smell greeted us, even when we were still several hundreds of yards away from it. ‘Walking into an open sewer must be like this,’ we jokingly commented to each other. Because we are not defeated easily, we bravely we made our way down to the beach, and begun to look for a spot to settle down in amongst the rocks and boulders. As we had hoped, the sea was fantastic, the breakers came in hard and fast, and the beach before us, at first glance, looked quite normal. Where then was that abysmal stench coming from? On closer inspection we found that, a few hundred yards to either side of where we were standing, we were surrounded by the most disgusting mess you can imagine. Huge piles of untreated sewage had been swept onto the beach by the sea, and more was arriving all the time. After some searching, we found a spot that looked and smelled somewhat neutral, but there clearly was no point in settling down anywhere. So, I stood for a while, to watch large flocks of gulls and crows. What were they feeding on so excitedly? Closer examination revealed that it was enormous piles of human waste material, which the sea is constantly and generously bringing to them on our behalves! That is when the thought struck me how inevitable it is that, one of these days, the Animal Kingdom must strike back at the human race for the problems we have created for ourselves, as well as everything that is unfortunate enough to have to share this planet with us. I am aware that our Creator will always take care of humankind, in spite of our at times incredibly bad behaviour. But I also know that we are responsible for all our actions, and that any suffering we cause to any other creature in the whole of Creation, has to be made good and redeemed, by none other than those who caused it. I shudder at the thought of the prospect of what is likely to come towards us, if we do not mend our ways – soonest! I am far from pleased about having to take part in it, when it does come. And if we carry on as we have always done, it will come for sure. But apart from all this, I find it deeply disturbing that any creatures should be feeding quite happily on what we, supposedly the higher and more intelligent species, are so carelessly leaving behind. That they are feeding on our waste, in itself, is not disgusting. They are merely doing the job they were created for, the best way they can. Each in their own special and unique way is here to serve the life our Creator has given to us, in return for the services that are being rendered to us. The birds we were watching on the beach that day were created to be the bin men of the skies. It is their job to clear up after everybody, including themselves and us. There is nothing wrong or disgusting about this. But, it is disgusting and irresponsible what it is that we are leaving for them to remove. In this case, it was the untreated waste from all humans living of a whole city, sick and healthy alike. It stands to reason that any bacteria and viruses our waste contains, is being picked up by these birds. They are likely to multiply rapidly in the bodies of these unfortunate creatures. If their immune system cannot build up the necessary resistance against our diseases, it may not take all that long until they become as sick as the humans the waste came from and maybe sicker. There is sure to be waste from people suffering from Aids and other contagious diseases, as the effluent is being flushed directly from the toilets in hospitals and sickbeds of the city into the bay. I hasten do add that this, obviously, does not apply to just this city, but to anywhere in the world where untreated sewage is still being pumped into the sea.